Happy Dusshera to You and Your Family Vidhya!!!! 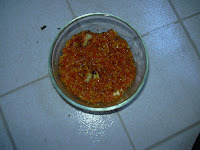 Carrot Halwa looks yumm..Happy Vijaya Dasami to You and Your Family Vidhya!! hi vidya..great idea..impressed on seeing ur blogs..i too a tamizhan from chennai..wen u have time visit my blog..waiting for ur comment..don forget to leave comment.. Thanks Sireesha, Happy dasera to you guys too. Thanks Jaishree, happy vijayadashami to you all too. Thanks Usha, Happy dushera to u too.